With the early onset of winter, the 2014 dredging season on Wonder Lake has come to an unexpectedly early end. The dredging contractor has spent the last few weeks preparing the dredging equipment for winter, and having it ready to go as soon as lake conditions allow in 2015. Overall, the contractor has completed approximately two-thirds of the proposed dredging in the West Bay, with most of that work done simply to allow the dredge and sediment pipeline to move more easily through very shallow areas found there. The MPOA will be working with the dredging contractor to develop a plan and schedule for minimizing impacts to lake users during the 2015 dredging season, and will release that information on the MPOA website prior to the resumption of dredging. In the interim, winter lake users are advised and cautioned that the dredge pipeline will remain in place in West Bay over the coming winter. 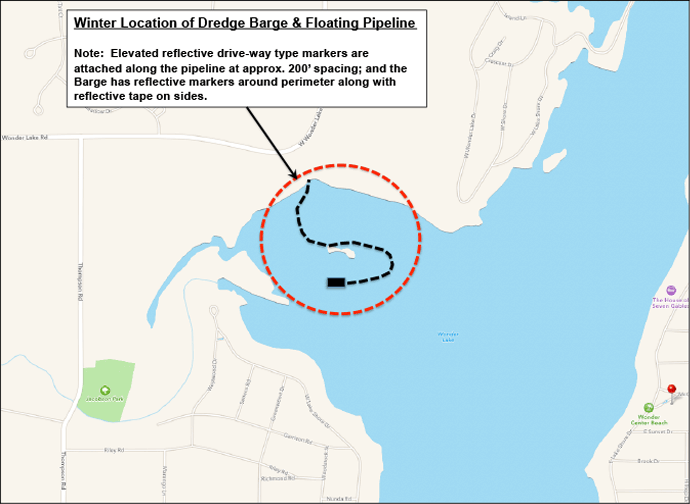 A diagram showing the approximate extent and location of any dredging apparatus left “in-lake” over the winter will be provided to those applying for winter decals from the MPOA, and will also be posted on the MPOA website.